Romney said he recalled a parade in which the school band marching with his father’s campaign only knew the Wisconsin fight song, not the Michigan song. 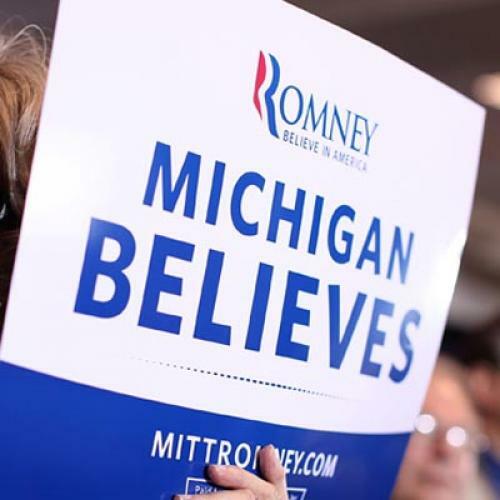 “So every time they would start playing ‘On Wisconsin, on Wisconsin,’ my dad’s political people would jump up and down and try to get them to stop, because they didn’t want people in Michigan to be reminded that my dad had moved production to Wisconsin,” said Romney, laughing. Didja get it? Layoffs in Michigan, jobs shifted to Wisconsin, fight song, tubas, cymbals...hilarious! Not that anyone except Romney thought that he still had a shot of carrying his home state, where the trees are the right height and he is down nearly 20 points in the polls to Barack Obama. But this may well put the Wolverine State out of play for good. Joking about his father’s laying off hundreds of people in a state that has in recent years suffered more economic trauma than just about any other? Shoulda stuck with the story of his dad spitting nails, spiky end out first. Seriously, Mitt: if you want to be a victor valiant and a conqu’ring hero, probably better not to pander to one swing state by laughing about the woes of another, much less the one you grew up in.